Colterris owner and manager Theresa High pours a glass of wine in the tasting room on East Orchard Mesa. Colterris recently doubled the number of acres from which it’s growing grapes with the purchase of Canyon Wind Cellars. Scott High, above, and his wife worked quickly to seal a deal to acquire Canyon Wind Cellars. Scott High made his girlfriend a promise years ago: Marry me, and I’ll buy you a vineyard. That vow came to fruition in the form of Colterris Wines, which harvested its first grapes in 2008 and released its first wine in 2010. Now Scott and his wife, Theresa, have doubled down on his pledge. Thanks to their recent purchase of the land, winery and equipment formerly owned and operated by Canyon Wind Cellars, the Highs will embark on a significant expansion that Theresa says will make Colterris the largest winery in Colorado producing 100 percent Colorado wine from grapes grown on its own estate vineyards. As of August, Colterris, which Theresa owns and manages, has doubled the number of acres from which it’s growing grapes and is operating two tasting rooms. High Country Orchards and Vineyards, which owns the land upon which Colterris operates, comprises a total of 126 acres at its location at 3548 E 1/2 Road on East Orchard Mesa, with 71 acres in peaches, 35 acres in grapes and another 18 acres in vacant, plantable land. It acquired another 54 acres from Canyon Winds’ location at 3907 N. River Road, 32 of which are planted in grapes. That brings High Country’s total holdings to 180 acres between Palisade and East Orchard Mesa. 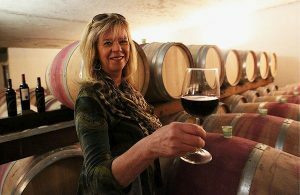 “To make critical mass, to have continuity, to have 100 percent Colorado grapes, to have world-class wine, we needed more premium vineyard acreage,” Theresa said. For the record, High Country, co-owned by Scott and Theresa, purchased the land and buildings from Canyon Wind and will lease the location to Colterris. Colterris purchased Canyon Winds’ production equipment. The deal closed in August. The Highs were planning to build a production facility for Colterris on East Orchard Mesa — Colterris has been produced at an off-site location — when Jay Christianson approached them this summer with a business opportunity. Jay and his wife, Jennifer, had announced in April that they were closing Canyon Wind, a 20-year-old winery started by Jay’s father, Norm. Theresa said Jay told Scott and her they didn’t want to continue in the business. The Highs had to work quickly, but they did their due diligence on Canyon Wind and decided it made a lot of sense for them. There were several reasons for that. Canyon Wind was growing grapes very similar to what Colterris grows — cabernet sauvignon, cabernet franc, petit verdot, malbec and merlot — plus chardonnay, sauvignon blanc, pinot gris and syrah. Its enviable location ­— at the mouth of De Beque Canyon, where warm breezes have prevented the vines from ever freezing out — helps ensure a steady harvest of grapes. And with a production facility already in place, the Highs walked into a turnkey operation rather than spending two years building a facility on East Orchard Mesa. The additional grape varieties means Colterris, which currently makes cabernet franc, malbec, cabernet sauvignon, and a white cabernet sauvignon, will add four more wines to its lineup in 2017: pink malbec, sauvignon blanc, chardonnay and petit verdot. Canyon Wind’s Palisade location also means Colterris will operate two tasting rooms. The East Orchard Mesa location will continue to be open to the public seasonally, from June through October. The North River Road winery will be open year-round, allowing Colterris to serve cold-season customers who stick close to Interstate 70. “There’s a lot of traffic that goes on in the off-season that doesn’t make it up our little road here,” Theresa said, referring to the East Orchard Mesa tasting room. A grand opening for Colterris’ new tasting room in Palisade will be held in the spring.